What does it take to become an effective leader? Sadly, few put in the time and effort it takes to improve their leadership skills. As author of the article, Learn to Listen to Your Team, Jim Kim recognizes leadership as a contact sport suggesting you will only find success in leadership if you listen to your team and understand how they respond to you. At Reliance One, We Build Teams. Our sales teams consist of Account Managers and Recruiters that are constantly working to develop themselves. Technical Recruiter, Wes Oliver, quotes “When I started, I made it clear I wanted to move into sales. My Manager Ryan Long supported my goal, set an example, and consistently pushes me to improve.” One of the motto’s “Don’t get comfortable” is constantly used around the office by Vice President, Jim Paquette. This motto reminds everyone that there is no finish line when striving for success. Our leaders expect change and are willing to adapt to whatever mission is set before them. 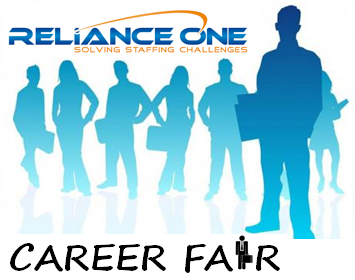 Tomorrow, February 20th, marks the date for Reliance One’s first career fair! The theme “Steer your Career” mirrors the company’s internal philosophy of creating your own destiny in a career of Recruiting and Sales. Voted Top 100 Workplaces by the Detroit Free Press and Coolest Places to Work by Crain’s, Reliance One offers a unique environment where employees are encouraged to grab the wheel and choose the career path they desire. Our primary goal is to identify individuals who are seeking a long term career path that revolves around Outside Sales and Account Management. Reliance One has lofty goals and we are seeking those that want to help blaze new trails for the company. The event will be held tomorrow, February 20th, 2013 from 11:00AM – 3:00PM at the Crowne Plaza Convention Center in the University Ballroom at 1500 North Opdyke Road in Auburn Hills, MI 48326. Candidates should bring updated resumes to share with on-site recruiters who will be conducting interviews. Successful candidates will be invited to the Reliance One headquarters on February 21st for a tour and additional interviews related to internal Recruiting and Sales opportunities only. If you are someone that is seeking an opportunity besides sales or recruiting, your resume will be distributed to our internal staff for consideration of our client specific needs. As an added incentive each candidate who attends the fair and visits the social media table will be entered into a drawing for an iPad Mini! For a chance to steer your career toward success come visit Reliance One tomorrow from 11-3 at the Crowne Plaza! If you are unable to attend the fair please send your resume to careerfair@reliance-one.com to be considered. Be sure to stay connected to Reliance One by following us on LinkedIn and liking us on Facebook . For the first time in the corporation’s history, Reliance One is hosting their own career fair. The theme “Steer your Career” mirrors the company’s internal philosophy of creating your own destiny. Voted Top 100 Workplaces by the Detroit Free Press and Coolest Places to Work by Crain’s, Reliance One offers a unique environment where employees are encouraged to grab the wheel and choose the career path they desire. Since 1998, Reliance One has employed thousands of employees and has served hundreds of clients in various industries, including Medical, Information Technology, Automotive, Finance/Accounting, and Manufacturing. Reliance One, Inc. has been recognized by Crain’s Detroit Business as one of the Top 20 Largest Staffing-Service Companies and the Top 30 Fastest Growing Companies within the State of Michigan. The event will be held on Wednesday February 20th, 2013 from 11:00AM – 3:00PM at the Crowne Plaza Convention Center in the University Ballroom at 1500 North Opdyke Road in Auburn Hills, MI 48326. Candidates should bring updated resumes to share with on-site recruiters who will be conducting interviews. Successful candidates will be invited to the Reliance One headquarters on February 21st for a tour and additional interviews.